The College Student Challenge is a student competition that takes place during National Engineering Month every March. 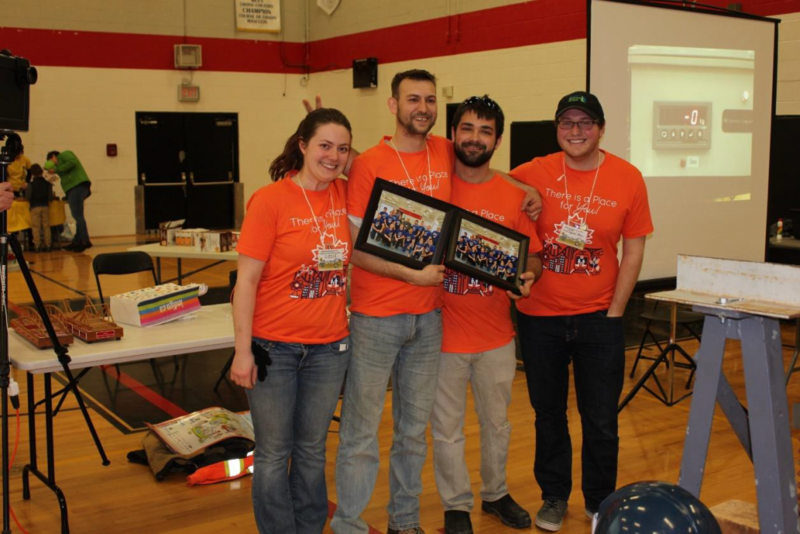 Teams of up to 5 students work together with their local OACETT chapter and volunteers to host one or more public outreach events in their local community. We’ve asked all the College Challenge entrants to submit a report to us. 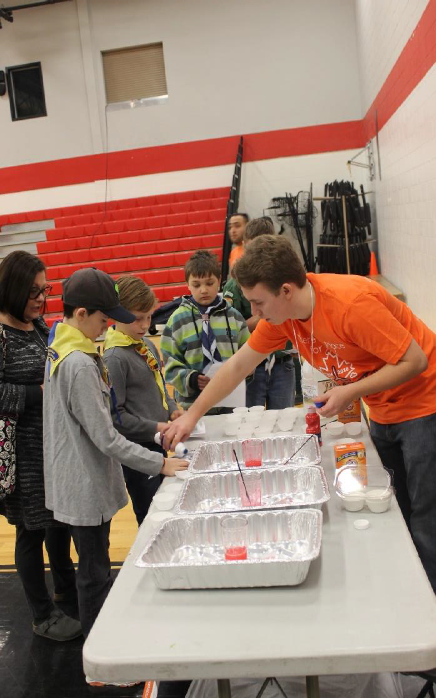 Here’s how students at St. Lawrence College celebrated National Engineering Month! For more College Challenge 2018 reports, click here! More than just bridge building! The Energy Systems Engineering Technology faculty brought an example of an energy source that is powered only by changes in temperature, and an infrared camera so the attendees could see firsthand the heat transfers that occur in our every day lives. Some youth even tested to see if flatulence gives off heat, and it does! Along with the high-tech displays, the event had little experiments for the youth to try personally, like building a tower with nothing but Play-Doh and straws, using triangle shaped construction paper to hold the most cookies, a volcano experiment using vinegar and baking soda, and the roller coaster challenge. These gave the youth a chance to approach a given task with no previous instruction and figure out how to accomplish it. A volunteer was always ready to answer questions and provide support, but the children had free rein over the direction of the activities, and the results were astounding. 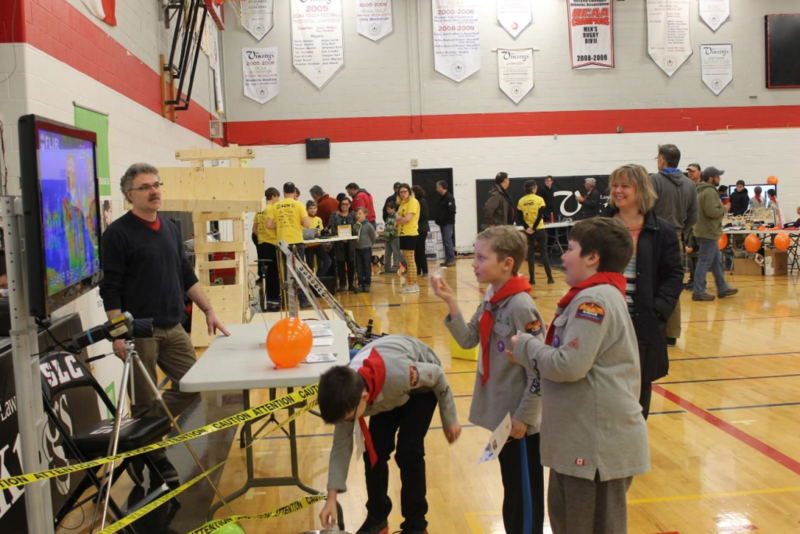 One group of Scouts managed to launch a marble projectile from the foam pipe roller coaster track to the cup a few feet away! Despite the set-backs, the organizers worked day and night to ensure the accessibility and comfort of everyone who contributed to the event- food was provided for contributors and judges, chairs were readily available to the tired, and volunteers were stationed at the entrances of the school to ensure that nobody got lost on the way to the fun. Along with event contributors, the response from local representatives was overwhelming. 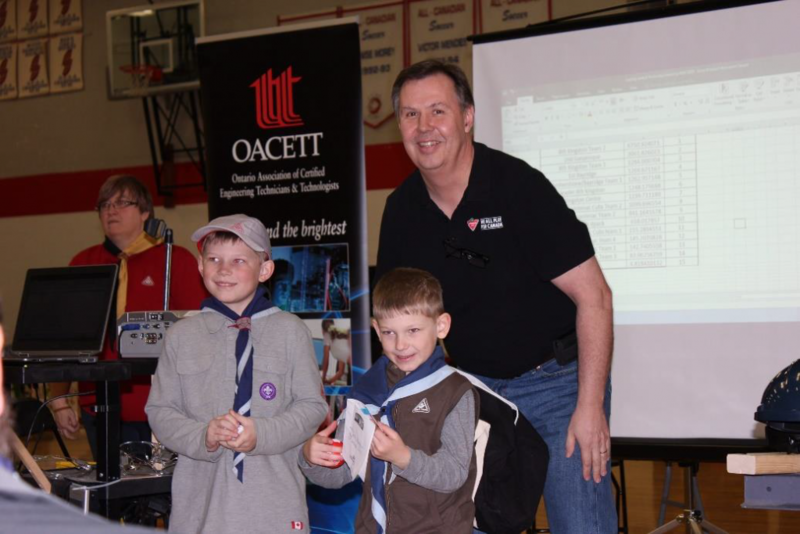 Kingston’s Mayor, Bryan Paterson, attended to give the opening statements, break a bridge, and see what the National Engineering Month event is all about, many OACETT members joined us for key moments (like cutting the N.E.M cake, such a hit last year that we had to bring it back! ), the Scout Leaders stayed long after their bridges were broken to visit the different booths, and the Whig Kingston reported on the event. 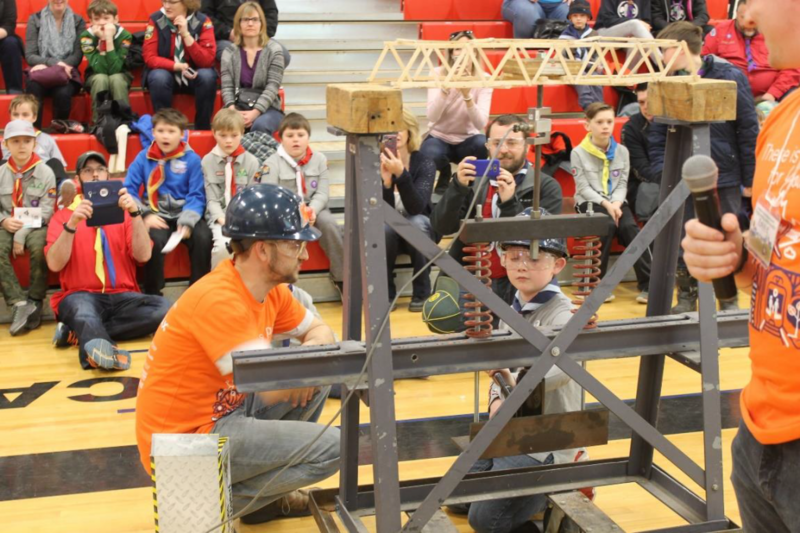 The result was an event that had something educational for people of all ages- the youth broke bridges and accomplished various tasks for stamps on their Activity Passports (redeemable for prizes), and the adults learned more about engineering in their local community. The engagement level was above what the organizers could have ever dreamed of. 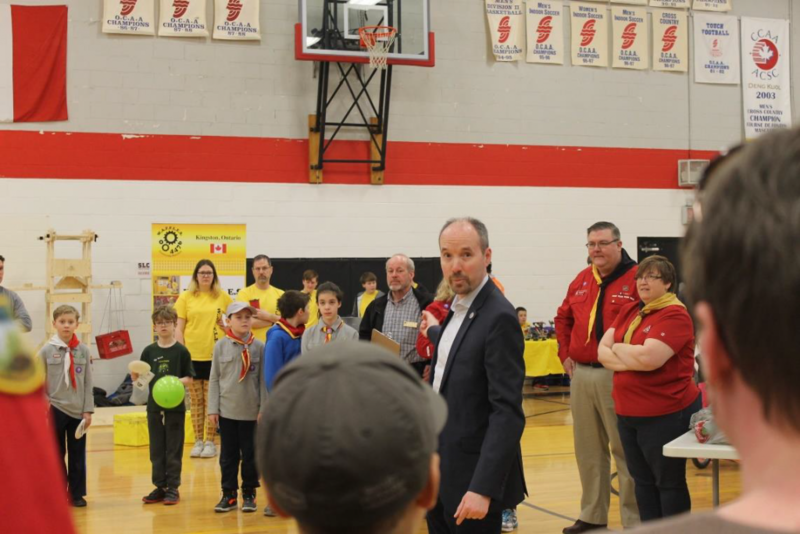 The most rewarding moment for all organizers was to hear an interview with one of the Scouts, who said that he wants to be an engineer when he grows up, because engineers “get to make robots and help people”. It was a bitter-sweet experience for half of the organizers- Mackenzie Charles and Michael Dias are graduating after 3 years of hard work and inspiring fellow organizers to explore every avenue possible to accomplish your goals, always keeping their passion for problem solving and quality work obvious in everything that they do. 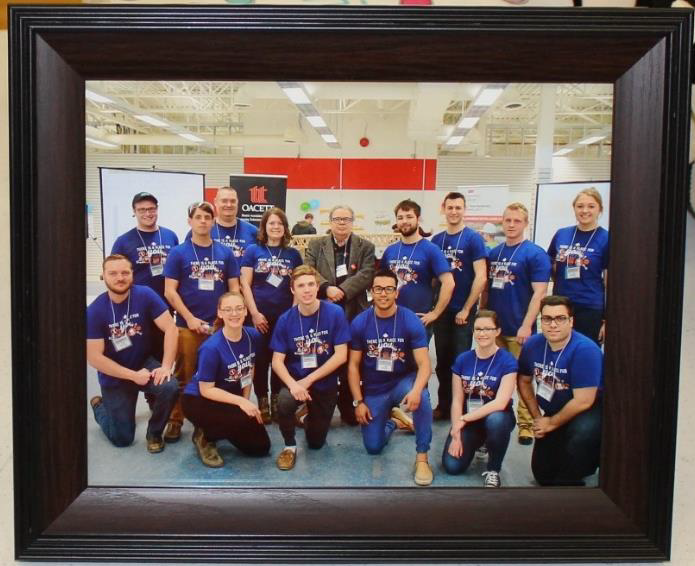 Matthew Snider and Elizabeth Doran had a special send-off present made for their fearless leaders, a picture of the entire team from last year’s event. They will both work tirelessly next year to continue the legacy of engineering excitement alive.